Included within the box is also a booklet containing money off vouchers for each of the perfumes in the box if you decide to purchase a full size bottle. It is delivered each quarter and only costs £5 per box! When testing a new perfume you really need to be able to try the product on your skin. By doing this, you allow the perfume to mix with your skin chemistry and show you its true fragrance. Simply spraying perfume on a card in a shop will never give you the full picture. Samples are the best way to get a taste of what a perfume has to offer. 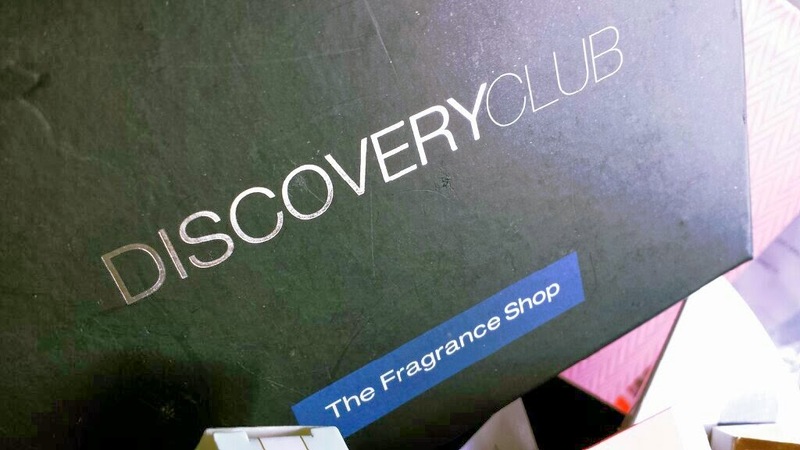 The Discovery Club is fantastic because it sends the samples straight to you without you having to hunt them down! Alongside this, they send you the latest releases for each season so you can keep on top of what's new. As you can imagine, being a mum restrains the original freedom that I used to have when being able to stroll down the fragrance aisles was common practice. Nowadays, being allowed to wander off in the direction of the perfume section is a luxury! My freedom is diminished, but my love of perfume is not. 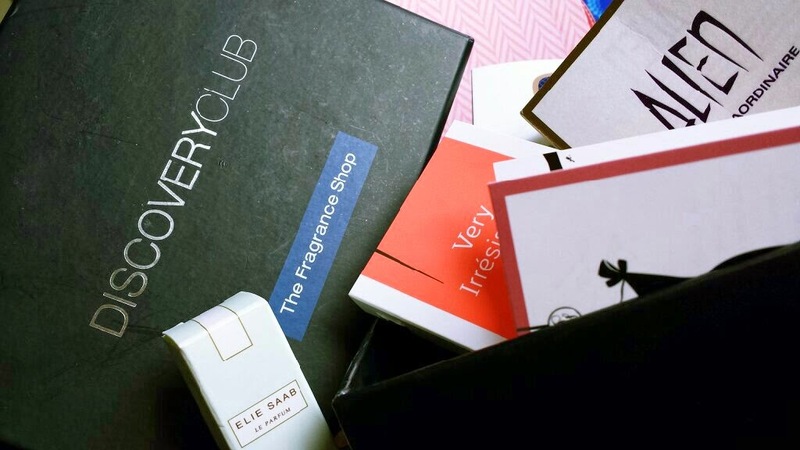 The Discovery Club box at least lets me keep some of the fun alive without the sound of my little man crying out in disdain at the realisation that he has been taken down the perfume aisle once again. Introduction to the Discovery Club aside, let's get to the specifics of this box, the first of 2014! 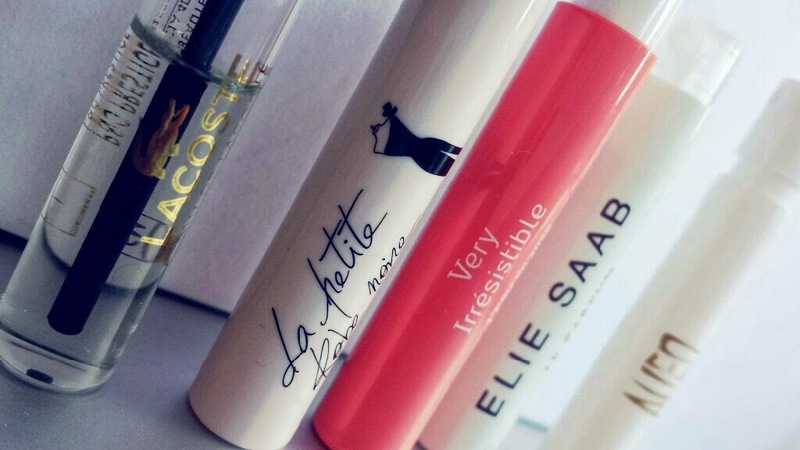 From left to right in the photo above we have: Lacoste - Eau De Lacoste Sensuelle, Guerlain - Petite Robe Noire Couture, Givenchy - Very Irresistible L'Eau en Rose, Elie Saab - L'Eau Couture and Thierry Mugler - Alien Eau Extraordinaire. I have missed out the two male samples (Loewe - Solo Sport and Valentino - Uomo) as I gave them away to my dad who also loves fragrance! So let's start with Lacoste. When I read that this was going to be included in the box, I was neither ecstatic or disappointed. My feelings towards it were pretty neutral and to be honest, I was expecting to simply 'like' it but not love it. I was incredibly surprised when I tested it! 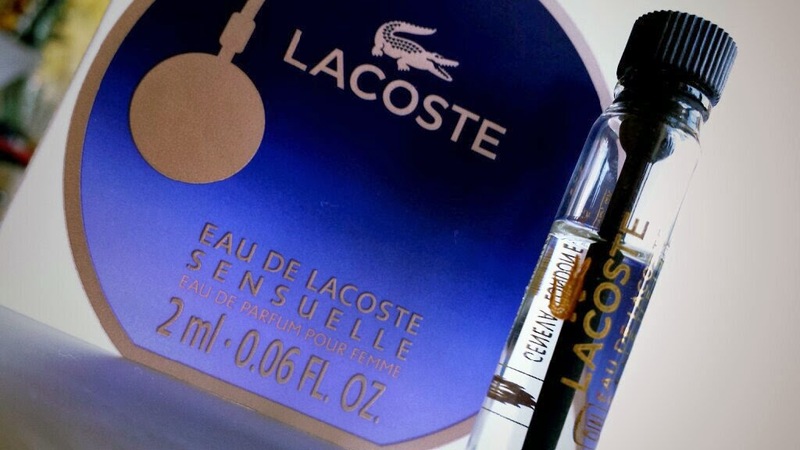 A flanker to Lacoste's Eau de Lacoste, this perfume is designed to replicate the mood of an evening as it progresses. It starts with a burst of pink pepper and blackcurrant which is said to be like the "refreshment given from an evening breeze," followed on by a blend of flowers - turkish rose, sweet pea and gladiolus - meant to act as the olfactory representation of sunset. The base notes of this fragrance are the real winners though, giving it the thing that I love most about it - nougat and amber mixed to symbolise the excitement of the night ahead! The nougat is beautiful. I think that this fragrance will appeal more to the younger generation, but even though it is designed to replicate the evening, I think it may be better suited for daytime wear. Prices for this perfume start at £32.50 from The Fragrance Shop, but the box includes a £5 off voucher to spend in The Fragrance Shop only. 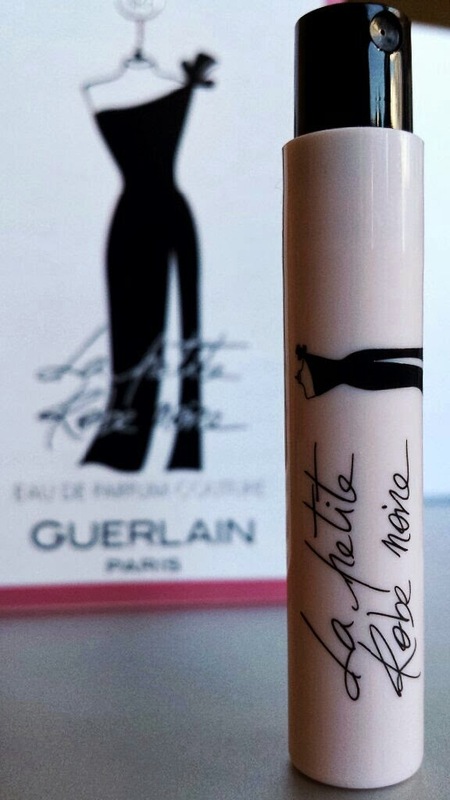 I am a huge fan of Guerlain's Petite Robe Noire of which this is a flanker of. I was super excited to see this included in the box! In fact, just a few days ago I wrote about Petite Robe Noire on my winter/spring transition fragrance list. I added it to the winter side of the spectrum, so I was curious to see how this would fit seasonally. This fragrance is definitely a springtime version of the original. It opens with a fresh combination of raspberry and bergamot, making it more of a vibrant, fizzy opening than its predecessor. The heart is kept simple with just rose, but the base notes add the complexity with patchouli, vetiver, tonka bean and moss completing the composition. Instead of cherry which is featured in the original, this flanker includes raspberry, making it almost reminiscent of Lancome's Tresor Midnight Rose but much more woody. Also long gone is the liquorice note meaning that it is less heavy. Perfect for spring! Prices for this start from £43.50 and again, the box includes a £5 off voucher for The Fragrance Shop only. Am I the only one who is a little tired of the over-saturation of rose themed flankers being released nowadays? 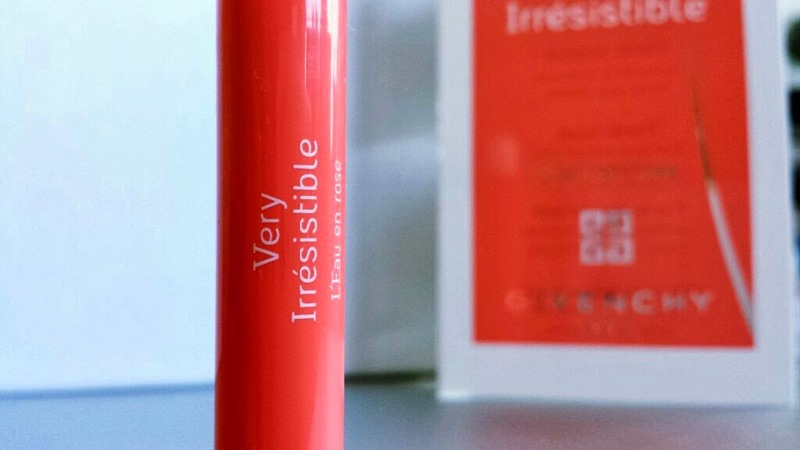 Givenchy add to their Very Irresistible line of perfumes with this rose scent. I have actually lost count of the number of flankers Very Irresistible now has, but even though I rather like the original, I've never really cared much for them. Therefore, seeing this in my box made me think 'another one!?' rather than feeling any excitement. These thoughts aside, this perfume is nice, if not a bit generic. The top note is a mixture of berries, followed by a heart of rose. Musk makes up the base of this perfume, rounding it off to be an inoffensive but sadly a little boring fragrance. If you are interested in trying this and you have not tried the original, I fully recommend that you try that first. The original is popular for a reason! By all means this does not mean that all flankers have to be boring (all of the fragrances in this box are flankers! ), but a little more creativity wouldn't go amiss! Prices for Very Irresistible L'Eau en Rose start at £51.99 and the box comes with the £5 off voucher to be used at The Fragrance Shop only. Elie Saab's original perfume was a stunner. Jasmine, orange flower, honey, rose, patchouli, cedar... Oomph! I was pretty happy to see this flanker pop up in the box, I must say. The only note this shares in common with the original is the orange flower which is the heart of this fragrance, but it retains its class! Joining the orange flower is a bergamot, magnolia and citrus opening, and an almond and vanilla base, creating a creamy almond-flower scent. 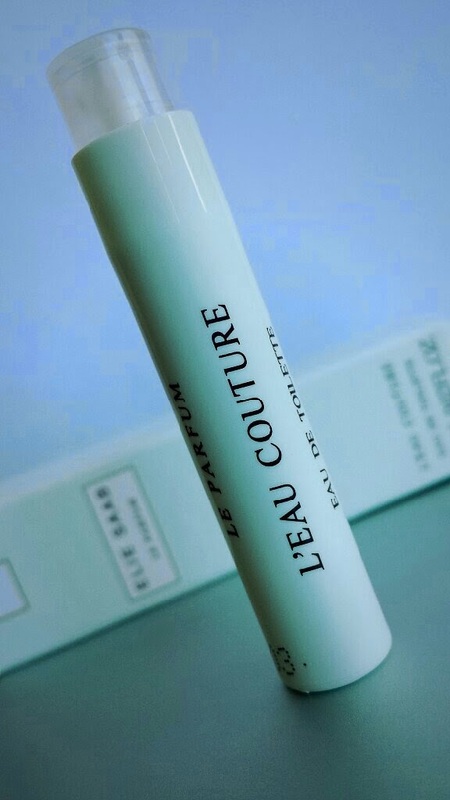 L'Eau Couture is fresh and sharp - a perfect spring scent. Even though this is an EDT formulation, the longevity and sillage are pretty impressive. It is no powerhouse, but it is enough to resonate with you for the day. Prices for L'Eau Couture start at £29.99 and once again, the £5 off voucher can be redeemed at The Fragrance shop only. And finally, last but certainly not least - Alien fans rejoice! - we have Thierry Mugler's latest Alien flanker, Eau Extraordinaire! I am a huge fan of the original Alien and the flankers for this scent don't usually disappoint. Boasting an impressive collection of flankers (albeit not as many as Mugler's Angel), some of the gems in the range include the Taste of Fragrance, Sunesscence Edition Limitee 2011 Or D'Ambre and Essence Absolue, but where does this one stand? To me, this is the commercial, easy-to-wear Alien. It is lighter than the original, but is far more impressive than the Aqua Chic flanker which I lost all excitement for after testing. Dropping the jasmine for the tiare flower note is reminiscent of the Luminescente flanker, but the only note the same as the original is the cashmere wood. The downside to this fragrance is the fact that the sillage and longevity are far less than the original. I would normally say that this is due to it being an EDT rather than EDP, but I own the Sunessence Edition Limitee 2011 Or D'Ambre which is also an EDT and the sillage and longevity are brilliant. 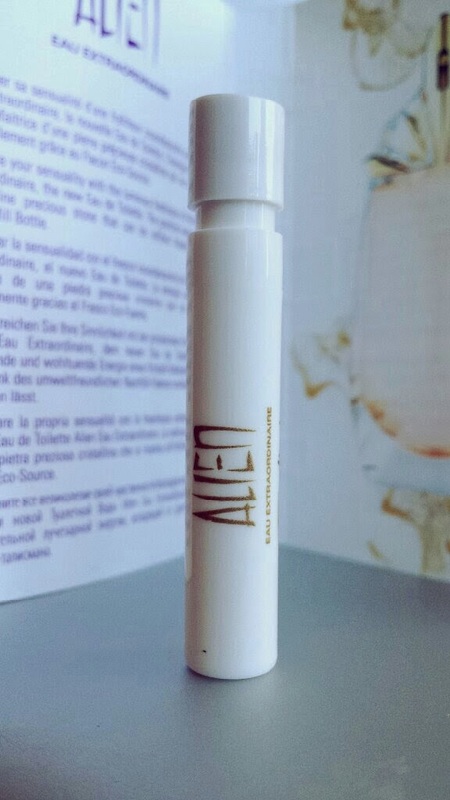 However, it is because of the differences between Eau Extraordinaire and the original Alien that brings me to my original conclusion - this is the lighter, more commercial version of Alien. Even with this, I still want it and I want to cover myself in it and live in a happy little, fantastic smelling bubble. Prices for this start from £49.50 and the box also comes with the £5 off voucher for The Fragrance Shop only. So there we have it! The first Discovery Club box of 2014 and I have to say that it's a good one! Are you subscribed to the Discovery Club? What did you think of this box? Leave a comment below!